The 2020 Jeep Gladiator has a unique design that's inspired by traditional SUVs. This all-new pickup truck has the signature Trail Rated badge, which implies best-in-class capabilities off the road. Visit Porterville Chrysler Jeep Dodge Ram to check out this mid-size car that's available in the Sport S, Rubicon, Overland and other editions. Having the Tru-Lok technology, the front and rear differentials maximize traction in the Gladiator's wheels. Electronic modules automatically synchronize the spin of the front and rear wheels. You can change the 4x4 drive settings by toggling a switch in the dashboard. 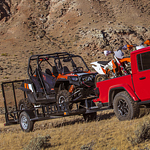 For example, the Off-Road+ Mode is tuned for optimum traction on rugged surfaces. The 2020 Gladiator also boasts the TrailCam Off-Road Camera, which detects obstacles in your projected path. The all-new camera system is integrated into the front grille to capture wide-angle views of the trails ahead. You can see the real-time recordings on the 8.4-inch UConnnect touch screen.